This muffin recipe comes from, Good Enough to Eat, the new novel by Stacey Ballis. And they are so good! For starters, I was pretty excited when I took them out of the oven and they had perfect high, rounded crowns. Yes, the recipe is healthy (whole wheat flour, less sugar, buttermilk and vegetable oil), but not so aggressive that you know it's too good to be true before you even start baking. They are moist, filling and definitely sweet, thanks to a lot of banana and some sugar too. To go along with the recipe, I got to interview the author herself. Stacey Ballis is not only a fellow Chicagoan (if you live here, you'll recognize many locations in the book), but the author of The Spinster Sisters and Room for Improvement, among other novels. 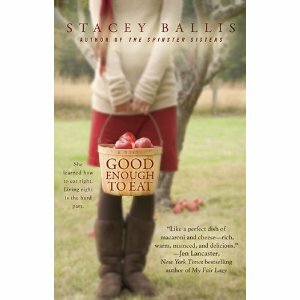 Her latest, Good Enough to Eat, starts with an intriguing premise: heroine loses 150 pounds and promptly gets dumped by husband. For a woman twice her size. Ballis describes food throughout the story (her heroine is a healthy chef) and includes a hefty assortment of recipes tacked on at the end. The recipes, however, are not an afterthought. They are well-written and clearly have been made and passed on by real people. As you can see, the muffins look excellent, and I promise they taste even better. Read on to hear what Stacey has to say about her book and writing about food (and to get the muffin recipe!). 1) From the title on the cover, to detailed descriptions of food prepared by various characters, to the compilation of recipes at the end of book, food is everywhere in this story. How did you come up with the dishes featured here? Stacey Ballis: With a few exceptions, the recipes are mine, based on years of both decadent indulgences and trying to eat healthier without losing the satisfaction of my favorite foods. There are one or two family recipes (brisket, chicken soup) and some printed with permission of friends (Susan’s Banana Cake, Doug’s Sesame Noodles). But in general they are just some of my favorite things to cook at home! 2) Melanie, the once-fat-now-skinny heroine, not only succeeds in an epic weight loss effort, but she also does a midlife career switch (from lawyer to chef/café owner) in one fell swoop. I think a lot of people fantasize about making a move this bold, but get caught up in real obstacles. What advice would Melanie give to another woman who wanted to follow in her footsteps? SB: Melanie is very lucky, in that she is in a financial position to both leave her career and go to school and focus on her health full time. And even then it takes her two years to achieve her dreams. By the same token, taking leaps this big in different areas of her life all at once can actually be helpful for her success. She is changing everything about her schedule and how her days look, so adding in regular exercise and healthy eating at the same time is maybe less shocking than trying to incorporate them into existing habits. I think Melanie would say first and foremost that whatever change you seek, there will never be the ideal time or situation. You can spend your whole life waiting, or you can just make the changes. Maybe you need to take school slow, one class at a time at night. Maybe you need to start your program bit by bit, adding in exercise, and learning about healthy eating gradually. But you have to start now, today, and be prepared for stumbles along the way, as well as little miracles. How did you, I mean Carey, get so wise? SB: Carey Peters is a real life holistic nutritional counselor and coach, and I worked with her for nine months myself in order to really experience what Melanie would have experienced with this kind of coaching. You can find her online at http://coachtoolstogo.com or on Twitter @CoachTools I cannot recommend her highly enough! Her wisdom is from years of school, training and experience, and the book only skims the surface of her wisdom. 4) For most of your recipes, you provide a traditional version alongside a healthier update. For example, we get both Banana Cake with Chocolate Frosting and Healthy Banana Muffins with Chocolate Chips. It’s a great way of saying that both must coexist for a truly balanced, healthy life. I’d love to know your favorite comfortingly indulgent food and your favorite light and nutritious dish (not necessarily from the book). SB: My favorite comfort indulgence is definitely mashed potatoes, and both my sensible everyday version and my “Thanksgiving/Special Occasion” decadent version are in the book. And yes, I think we need both in our lives! 5) You have a blog called The Polymath Chronicles. Besides writing and cooking, what are your other talents? And will any of them be part of your next book, the way food is in Good Enough to Eat? SB: I’m pretty good with all things related to decorating and entertaining, I give a good backrub. I’m pretty handy with tools. I am an exceptional packer. I don’t know if any of these will make it into the next book, everyone will just have to stay tuned and see! The only change I made was to use whole wheat pastry flour. Stacey uses 1 1/4 cups all-purpose plus 1 cup of regular whole wheat. Go with whatever you have on hand. Preheat oven to 375 F. In a large bowl, whisk together 2 1/4 cups of the flour, baking powder, baking soda, cinnamon and salt. In another large bowl, whisk the egg, oil and buttermilk; add banana and mix well. In a small bowl, toss walnuts and chips with the remaining tablespoon flour (this prevents them from sinking during baking). Pour wet ingredients into dry ingredients and stir gently until flour is just moistened. When you're nearly done stirring, add the walnuts and chips; do not over mix. Coat a standard muffin pan with nonstick cooking spray or use paper liners. Fill cups about three-quarters full and bake until a tester or toothpick comes out clean and muffins are light golden brown, 15 to 20 minutes (mine took 18). This sounds like a book I would really enjoy. I've always liked books that have a nice storyline and recipes. I'm also going to try this recipe as I just picked up some whole wheat pastry flour the other day and am always looking for healthier sweets. GETE was the first of Stacey's books I've read. Since then, I've collected them all. I love the cover art because it represents the story so well. To me, the fresh picked apples can be transformed into a warm apple pie or enjoyed just as they are. Her Ugg style boots represent the comfort we find with good food and good friends, two key elements in the story. I'm always on the lookout for uses for bananas! This looks like a great and reasonably healthy recipe! Can't wait to try it! Those muffins look beautiful and I think I'll order the book. Sounds good! But back to the muffins, I like that they have high tops. Great information here. You've been cranking out some good posts lately! These muffins are so delicious! They taste like light and fluffy banana bread. Thanks for this recipe.